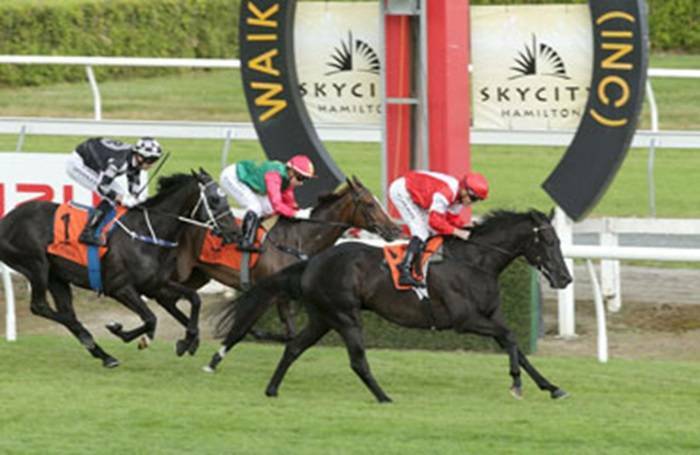 The Murray Baker and Andrew Forsman trained Mongolian Marshal exacted a measure of revenge when he turned the tables on his last-start conqueror in Saturday’s Gr.3 SkyCity Hamilton Waikato Cup (2400m). The promising High Chaparral four-year-old had been defeated by race-rival Igraine when the pair clashed for the first time in last month’s Gr.3 Counties Cup (2100m). This time it was Mongolian Marshal who gained the upper-hand as he produced a powerful burst in the home straight to out-finish the pace-making Igraine, who fought on bravely for second ahead of top-weight Five To Midnight. Co-trainer Murray Baker believes the improved footing, with Te Rapa racing on a Dead4 surface as opposed to the Slow7 at Pukekohe, was a key component to the victory. “The plan was to hold him up a bit so he could sprint and he sprinted well enough,” he said. “The track might have tripped him a wee bit at Pukekohe although the winner was far too good that day. “I have to be honest in that I was wondering if he was just a 2000m horse although he did run eighth in the ATC Derby (2400m) where he came from well back. Baker wouldn’t be drawn on future plans for his charge who races in the colours of co-owner, the Inner Mongolia Rider Horse Industry (NZ) Ltd, whose principal Mr Lang Lin is commonly known as “Mr Wolf”. “We will have to go home now and have a think about it but he is a quality horse,” he said. The win capped off a productive period for the Baker/Forsman team who saw their lightly raced Savabeel filly Queen Of Diamonds hand out a beating to her three-year-old rivals in the Gr.3 Lawnmaster Eulogy Stakes (1550m) at Awapuni just twenty minutes earlier.